Baby's-breath (Gypsophila paniculata): growing, planting, caring. Clouds of tiny white flowers! 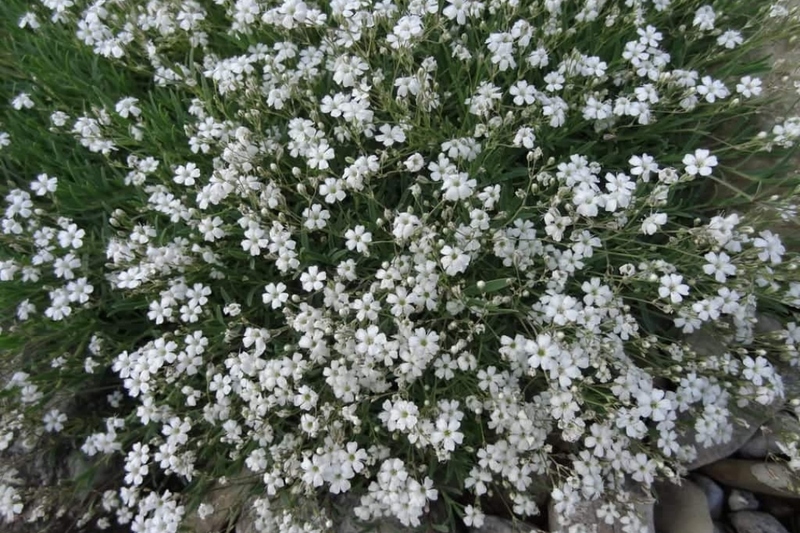 Gypsophila paniculata - baby's breath - is a species of flowering plant in the Caryophyllaceae family, native to the dry and sandy steppes of central and eastern Europe, and a popular ornamental garden subject. It is an herbaceous perennial growing to 1.2 m (4 ft) tall with stems covered in clouds of tiny white flowers in summer - hence the common name "baby's breath". Numerous cultivars have been selected, including 'Bristol Fairy' or 'Rosenschleier’, with pale pink double flowers. Gypsophila paniculata is now widely distributed in North America and classed as an invasive species in some places around the Great Lakes. The most common species of gypsophilas is Gypsophila paniculata. It is a branched perennial, with linear, lanceolate, glaucous leaves 5 to 7 cm long, that gives a vaporous look to the plant. The habit is rather domed, and the flowers, at the end of the stems are organized in white panicles, light, with 5 petals in trumpets. Plant the gypsophilas in finely worked beds (digged without turning over the soil, scratched and raked), after the last spring frosts. Once the bed is properly prepared, simply make a small hole with a transplanter, remove the plant from its bucket, put it in the hole, and tamp the soil to put it in contact with the roots. Respect a spacing between the plants corresponding to a third of their final width. Water copiously to facilitate rooting. In pots, plant in a draining mixture, like potting soil, with calcareous gravel at the bottom. Mulch your beds in November and April, to amend the soil, protect it, limit weeding and watering. Keep the soil moist - watering in fine mist - until seedling emergence, then water about once a week, allowing the soil to dry between two waterings. Summer watering is only necessary in case of hot weather, or for potted plants of course, to enhance flowering. Perennial breathers multiply by seed, so consider harvesting seeds in the summer, and sowing them under cover from February between 13 and 18 ° C. Plant them in a bucket in the spring.